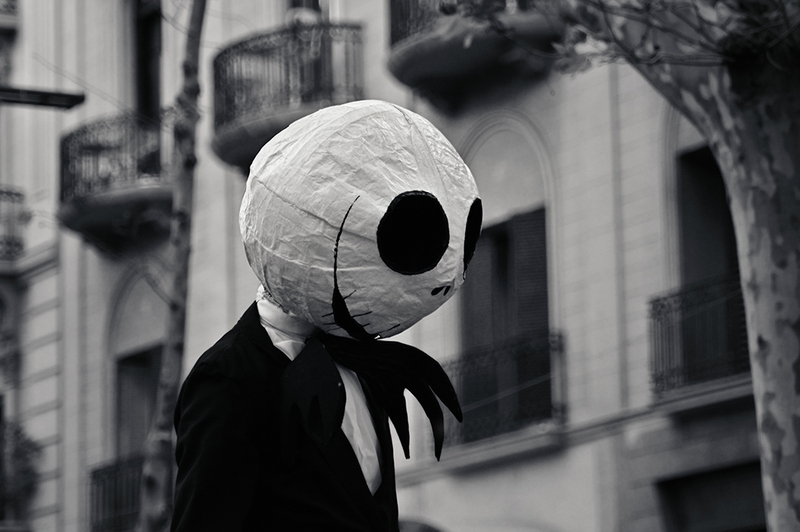 Jack Skellington from Tim Burton's The Nightmare before Christmas was seen on Las Ramblas the other day trying to go incognito without success. Hordes of fans immediately spotted him, then came the press and photographers to cover the story. I was lucky to be there. After rejecting some important media by pulling his head off and throwing it at them he insisted on meeting locals. That was when I entered the scene. He confessed that he was bored of Halloween Town and had decided to share the Christmas spirit with us here in Barcelona. After that, I tried to contact Santa on many occasions to give him the big news but every attempt was in vain. I just picked up this message from the answering machine: "I am out for my December holidays please leave your message...". It's funny, I swear I could hear a stifled voice, something, like: shh,erg,grrm...tk...rrr...d...ol...ph...ins...td. I hope I transcribed it correctly. But then again, it was problably a bad connection.